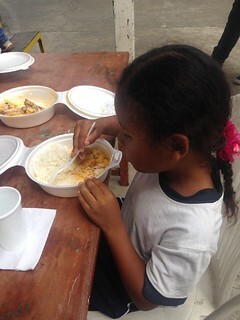 Saturday, November 21st the Mission of feeding 20 afro-descendant children began in the Trinitarian Island, which is located 45 minutes away from the city of Guayaquil. 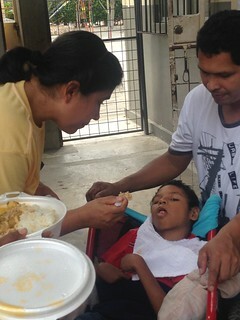 To carry out this mission, it was necessary to have volunteers who were willing to contribute a minimum donation of $5. It was said and it was done. 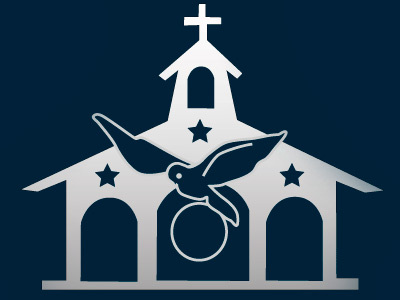 The lay people of the Home of the Mother of Guayaquil took responsibility for this work of mercy consistent with feeding the hungry. Some took care of doing the cooking and taking the food to the children, and others helped with the economic part, trying to figure out how to raise funds. Three ladies and a girl from the Home bought everything necessary for the preparation of the food. We began to prepare everything around 10:00 am, ending at 11:30 am. In the background you could hear music from other members of the Home that encouraged the cooks to prepare the food with love. At noon other members of the Home began to arrive who were responsible for serving food on disposable dishes and packaging them for the trip. 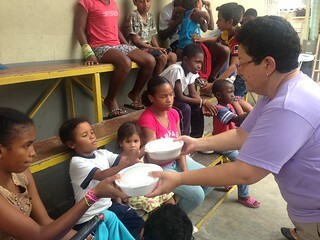 During the journey, the holy Rosary was prayed asking the Lord and Our Mother for these children who will receive food every Saturday, and prayed so that we will be able to continue this mission for a long time. When we arrived, a few children were waiting; although others were missing and were delayed 20 minutes because they had to walk from their homes to the St. Rose of Lima School. 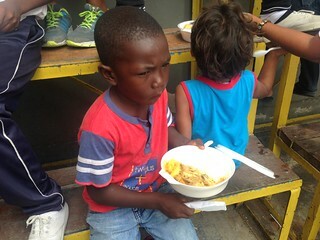 Other children left because they had classes in the evening and they had no time to eat. Joy and satisfaction filled our hearts for having done a good work and for having fed these children who will surely be anxiously waiting for our arrival the next Saturdays. The experience that I lived was a special grace. I felt the excitement, joy and desire to participate, to prepare the food, bring it to the children and share a simple meal but full of that main ingredient which is called love, given and received by our Father through his Son and Our Blessed Mother. I am sure that this same feeling was that of my lay sisters and brothers of the Home of the Mother as we congregated on Saturday the 21st, at home, to prepare a tasty chicken stew, and bring it accompanied by the human warmth, water and delicious bananas. We also received these same feelings of happiness from these little children. My heart shuddered to the point of crying surprised by the fortitude of those who are leading this human group so vulnerable and needy. And this encouraged me to imitate their example of love of neighbor. For us, this experience has been a real recognition of the love of God into our Home because we have observed firsthand the material and spiritual poverty of these people. As an example, I’ll mention the case of a family of four girls and a 9 year boy with an 85% disability who is in the care of his older sister who is 13 years old (she still attends the 6th grade at school). The parents of these children, due to necessity, devote themselves to the selling of fish. Cases like this make us open our eyes to God's mercy. Given this reality, we invited the married couples, the young people and all those that can contribute, to join in this project for the needy, for the Lord will not be outdone in generosity. We have found that the ones who actually ended up being helped, were ourselves.